Newell Convers Wyeth, better known as N.C. Wyeth, grew up on a farm in Massachusetts at the end of the nineteenth century. Wyeth showed his artistic talent early, and studied at the Massachusetts Normal Art School in Boston. 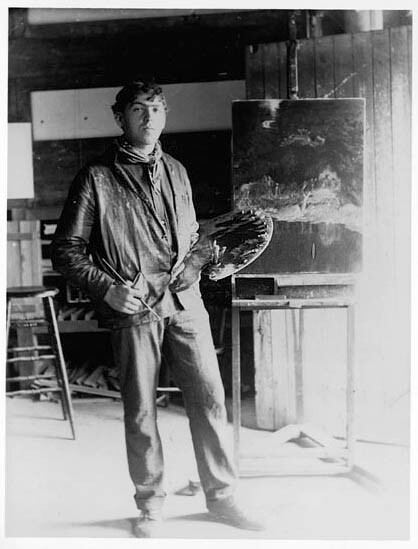 In 1902, Wyeth received the opportunity that would shape the rest of his career and firmly cement his place in the canon of American art—to study with the father of American illustration, Howard Pyle. Arguably the most successful of Pyle’s protégés, Wyeth encapsulated all of his teachings and within two years was well on his way to establishing his own career. Wyeth ventured west in 1904 and 1906, spending vital time observing, studying, and absorbing all the rich subject matter of the west. 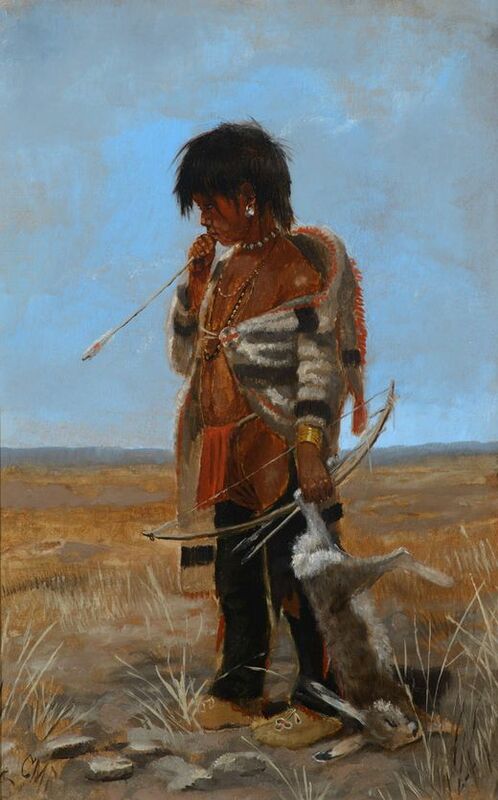 In his own words, Wyeth described this early attraction, saying, “The West appealed to me as it would to a boy; a sort of external effervescence of spirit seemed to be all that substantiated my work.” (1) With trips to both Arizona and Colorado, Wyeth not only worked as a cowboy but also lived with the Navajo for a short time. He received numerous commissions for western subjects from Scribner’s, The Saturday Evening Post, and many more. It was during this period that Wyeth created most of his Native American pieces, including He Rode Away Following a Dim Trail Among the Sage. A Sample of The Saturday Evening Post Cover Illustrations by N.C. Wyeth, View more here. While the point in the story that Wyeth chose brings a certain anguish and sadness, the painting holds out hope for the future. Svenson sits poised on his pony, hat in hand, looking out across the horizon. He allows his horse to graze, caught for a moment in reflection, thoughts of what he leaves behind as well as what the future holds comingling in his mind. Wyeth sets the tone by illuminating the scene with a warm, captivating sky; the sun is setting on the character’s past, but with its beauty holds out the promise of a better future. 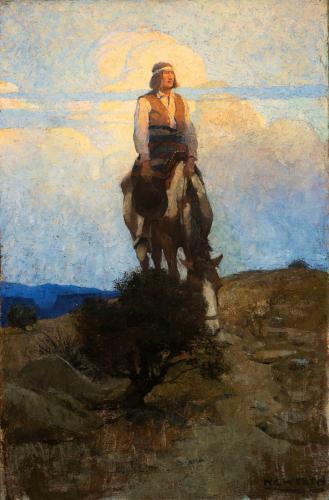 N.C. Wyeths He Rode Away Following a Dim Trail Among the Sage will be at auction September 16 in Session II of Jackson Hole Art Auctions September sale. View Jackson Hole Art Auctions September 2016 catelogs here.